The perfect lip liner to add definition and finish the look. This stunning array of shades is the result of over two years of gathering colors that inspired us from street fashion, runway trends, personal favorites and perhaps, most importantly, feedback from our clients! By using the trusty color wheel and the principles of color science as our guide, we whittled our picks down to this streamlined, comprehensive collection that is divided into Cool, Warm and Neutral categories for all skin tones and packaged in our sleek tubes with doefoot applicator. Coming soon! 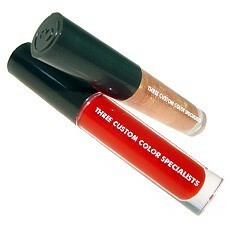 Our Lip Glosses will be available in refills for your Refillable Trio Compact!